Do We Need to Listen to a Lecture at Church? Can you have a church service without hearing a preacher speak? Will you try? My wife and I recently visited a church. Though we didn’t know it before we walked in, their service would be different that week. There was no sermon. They used the normal sermon time to talk about the missionaries their church supported. They explained each missionary’s focus and updated us on their status. They shared the joys and concerns of their missionaries. People on the mission’s committee prayed. Then the service ended. The lead pastor didn’t say a word. Several people apologized for there being no sermon and invited us back to hear their minister speak. From my perspective it was a profound, meaningful service. We need more like this. 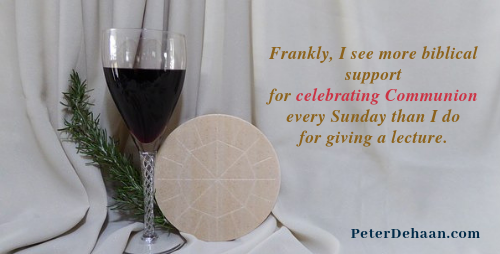 As I understand it, the Reformation removed the communion table (The Lord’s Supper, Holy Communion, the Eucharist) as the focus of the Sunday service and replaced it with the sermon. I get why they did it, but it was a mistake – a grave one. This fixation on the sermon is wrong. Though instruction has its place, teaching doesn’t facilitate community. It doesn’t allow us to minister to one another (as we should), and it doesn’t serve the world around us (as we ought). While listening to an overly educated person detail the minutia of scripture every week may have intellectual appeal, it does little in a practical sense to deepen our community and advance our faith in action. Let us dare to envision a church service without a sermon. Let us reimagine our weekly gatherings as a place to foster spiritual community and promote the love of Jesus to those outside the church. It starts when we kill the sermon. Will you dare to do it? How would you react if you went to church and there was no sermon? Can you think of a New Testament passage that talks about a local minister preaching a sermon every week? Do we NEED to listen? I doubt some do listen, but day dream during the message. But I WANT to listen and learn more. Sometimes we watch several sermons on TV (Dr. Charles Stanley whom we have visited in Atlanta) before we go to church. Oh, yes, I can learn alone from my Bible, but it is interesting to hear others’ take on things. That’s why I follow your blog, BTW. But when one studies with other “on fire believers, there is a fellowship shared that feels right and good and complete. We are Believers together in unity for Christ even though in possible diversity of everything else. We are blessed to support several churches that do this for us. You are so right that listening is important. Thanks for pointing that out (and for reading my posts). What you are describing here– Sunday worship without a preacher– sounds a lot like a Friends Meeting (unprogrammed Quaker worship). I think the Quaker tradition may have much to offer post-modern Christians. Just my thoughts. Great blog post! K.Rae, thanks so much for your comment. What I have read about Friends / Quaker worship and practices draws me. I hope to someday experience it.